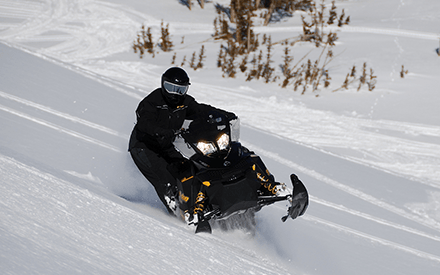 Togwotee Pass is a snowmobiler’s paradise. For the powder hound there are endless adventures in backcountry bowls and mountains in the deepest lightest snow in the country. 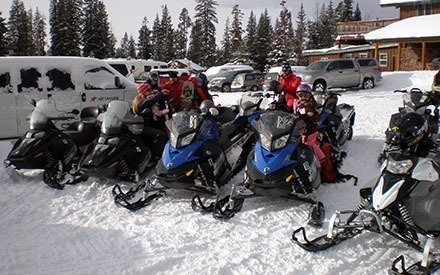 With over 600 miles of groomed trails the touring rider can ride the Continental Divide Trail System through picturesque alpine forests and wide open bowls with the most amazing views of the Teton Mountain Range. This adventure is a 45 minute scenic drive from Jackson. 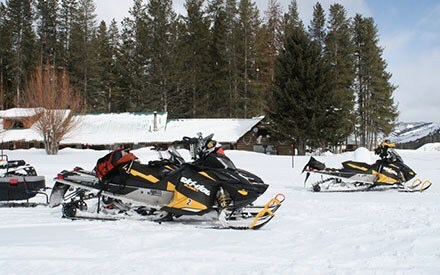 Check out Togwotee Mountain Lodge and Brooks Lake Lodge for lunch and gas. 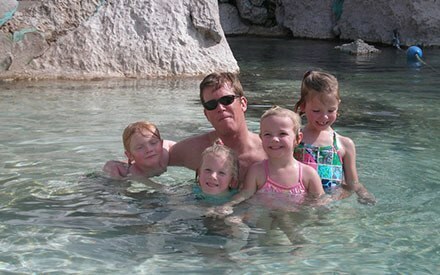 Granite Hot Springs is a great way to spend a day of snowmobiling in Jackson Hole. A short 30 minute drive south of Jackson, the Granite Hot Springs trail takes you through11 beautiful miles of the Bridger Teton National Forest on a well groomed trail with abundant open fields to discover. Pack a lunch for a picnic and don’t forget your swimsuit and towel so you can enjoy a relaxing soak in the naturally fed hot springs, which ranges from 105 – 112 in the winter. Just 40 miles through the Snake River Canyon, in Alpine, is the trailhead to the Grey’s River Range. With over 150 miles of groomed and un-groomed trails this is one of the best areas to explore Wyoming’s vast mountain ranges. 30 miles in you can stop, warm up and have lunch at the Box Y Lodge before heading back out for an afternoon ride. Gros Ventre River range is one of the best trips to view wildlife. For the first 15 miles the rider must stay on the groomed trial because you go through critical winter habitat and pass elk winter feed ground. Encountering bighorn sheep, moose, elk, deer, and coyotes are all a possibility on this trip and if you are incredibly lucky there is a wolf pack you can see. Once past Goosewing Ranch the riding opens up to endless possibilities, stay on the trail which will lead you to Togowtee pass and the Continental Divide Trail or stay in the area and explore the Red Hills of the Gros Ventre range.